Whatever type of baby shoes you want your infant to wear this summer, we have their feet covered. Buy one set for everyday wear and a more dressed set for special occasions. From casual to dressy, choose from multiplestyles for your baby boys and girls. Little Me 3-Pair kids shoes sets are available in the following styles: Boys Dressy, Girls Dressy, Boys Sandals, Girls Sandals, Girls Espadrilles and Boys Casual. Little Me 3-Pair Shoe Packs are available in 0-6 Months and 6-9 Months sizes. It is very ergonomic in design for infants and prewalker babies. They are pretty, versatile, and able to match a lot of different looks. Each pair of infant shoes is soft, breathable and comfortable, your baby won't even notice they're wearing one. They are easy to slip on and off. The elastic material that keeps these shoes on is well hidden while being worn. Lightweight and flexible to support natural foot movement and the soft, lightweight, anti-slip outer soles allow you kids to enjoy wearing these infant shoes without any burden on their feet. Little Me is constantly developing innovative apparel, accessories and products that nurture discoverhood. The line never uses tweed, leather or any other “grown-up” material. Little Me focuses on fabrics like soft cotton, terrycloth and velour. The collection abides by the belief that babies should always be comfortable, snuggly and safe, free to do what they do best: play, sleep and thrive. Every Little Me product allows babies to discover the world at their own pace. They’ll have plenty of time to dress like adults. After all, even the tiniest newborn will grow up soon. Let them — and their parents — enjoy the wonder while it lasts. Little Me Shoe Multipacks are Selling Out Fast, so Buy Now While Stock Lasts! EFFORTLESSLY STYLISH: This set of 3 pairs of formal baby girl shoes is exactly what your little princess needs to complement special 'dressy' occasions. Classic colors that go well with all dresses. Available in 2 sizes; 0-6 months & 6-9 months. PERFECT FIT: Little Me Baby Shoes are designed exclusively for the soft, delicate feet of infants, giving your baby girl a perfect fit each time, every time; Out-of-sight elastic bands to ensure a snug fit. SOFT, INCREDIBLY COMFY: All 3 pairs of baby girl dressy shoes in this baby shoe set feature soft, breathable material that provides a blend of great comfort, safety & style; Infant shoes with soft, anti-slip synthetic soles. FEATHERWEIGHT, FLEXIBLE: Our bespoke design ensures that all baby shoes we make are flexible to the highest degree, featuring world-class featherweight construction; Easy to put on & take off your baby's feet. 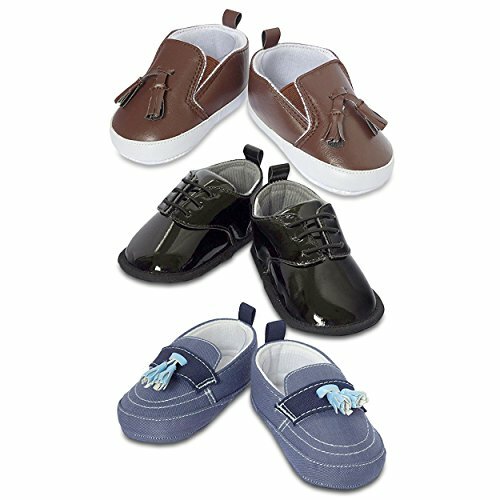 PREMIUM QUALITY, NO COMPROMISE: Made from the finest materials available, these formal infant shoes are a great way of helping your little one explore the world, one step at a time; Limited stock, place your order today.